In what ways does Buckwheat honey stand out amongst other honeys? Contrary to what its name suggests, Buckwheat is neither a grain nor grass. It is an oddly triangular shaped fruit seed with a thick, hard, brown-color hull. And Buckwheat honey is gathered from the nectar of the white or pink Buckwheat flowers which are widely cultivated in the northern United States (such as Minnesota, New York and Ohio) where climates are cool and moist. The bees love the fragrance of the tiny and delicate Buckwheat flowers. Buckwheat honey is a controversial, love-or-hate mono-floral varietal. The taste of this dark honey (some varietals are so dark that you can't see through the jar) may vary to some extent depending on the specific varietal of buckwheat plant and its place of harvest. It is often described as "rich and dense", "distinctive", "strong and deep", "robust", "heavy-bodied", "bold", "pronounced aroma", "flavorsome", "butterscotch-like", "reminiscent of molasses", "caramel-like", and "malty tones". Negative tags commonly given to Buckwheat include "pungent", "musty", "astringent", "penetrating and persistent", "tannic", "grassy aftertaste", "spicy", and "bitter". Hailed as a fabulous substitute for maple syrup, Buckwheat honey is often drizzled over toasts, crepes, pancakes or waffles. As stout and complex as honey gets, buckwheat honey is a highly favoured choice for beer brewing and a perfect choice for marinating meats in roasted and barbecued meat recipes. It also pairs excellent with goat or blue cheese. Buckwheat honey, nature's superfood, is considered as one of the most medicinal honeys around. It has higher concentrations of macronutrients, trace elements and anti-oxidant compounds (Plant Foods for Human Nutrition, September 2017). Rich in polyphenols, Buckwheat honey is especially sought-after for strengthening the capillary walls and thereby reducing the risk of high blood pressure, preventing stroke, arterial hypertension, and cardiovascular diseases, as well as improving blood formation, deficiency of blood and treatment of anemia. It is also recommended as an efficient varietal for reducing cholesterol and weight loss programs. Essential minerals such as iron, zinc, copper and magnesium present in Buckwheat honey also help in promoting the health of muscles and nerves. Antioxidants are immune boosting properties and compounds that can reduce oxygen radicals and thus counter their toxic effects. Darker honeys, specifically honey from buckwheat flowers are loaded with a greater amount of antioxidants than other honeys. In a study of 19 honey samples from 14 different floral sources (Journal of Apicultural Research, 1998) reported a significant correlation between color and antioxidant content of the honeys, with darker honeys possessing higher level of antioxidant activity. Buckwheat honey had the greatest antioxidant strength. And findings were confirmed by Journal of Agricultural and Food Chemistry (2000). Following this rationale, Buckwheat honey, one of the darkest honeys produced in the U.S, is often used in treatment of wounds and burns, ulcer, infections, fever, gastric ailments, and radiation sickness. Darker honeys are often recommended for children who are coughing as they contain more bioactive compounds. 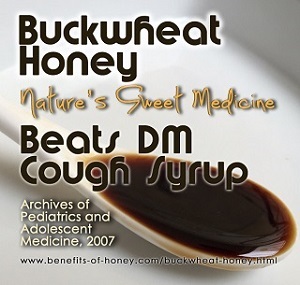 Many studies have shown that Buckwheat honey is more effective than over-the-counter cough syrup for treating a cough. For instance, in a study of children aged 2 to 18 (Archives of Pediatrics and Adolescent Medicine, 2007) who had colds and coughs. One third of the children received artificially-honey-flavored dextromethorphan (DM) cough suppressant, one third received real buckwheat honey, and one third were given no treatment. It was found that honey was better than no treatment and also significantly outperformed DM syrups. It reduced the number of coughs, the severity of coughs, and improved sleep for the children. Buckwheat honey - a great honey varietal which everyone should absolutely try! 1. If you are residing in Singapore, check out the Buckwheat honey in: Bee Healthy. 4. Never liked honey? Read this as you may just change your mond and give honey another chance: Taste Honey? No Way! End of "3 Great Reasons to Eat Buckwheat Honey". Back to "Exploring Honey Varieties!"